UPDATE- Austin to Boston- “Will & Purpose”! For those of us who rescue, knowing that the life of an innocent animal has been saved is thanks enough. It’s an incredibly exhilarating feeling. Each rescue is a small victory in the scheme of things, but to that one animal it’s the world- often life! Of course they are all special, but periodically, though not frequently, a very, VERY special dog comes along. I have been fortunate to have rescued two in the past four years. One I kept- my beloved Mr. Kippers whose “will and purpose” has raised thousands of dollars, as well as awareness, for other abused and abandoned animals. 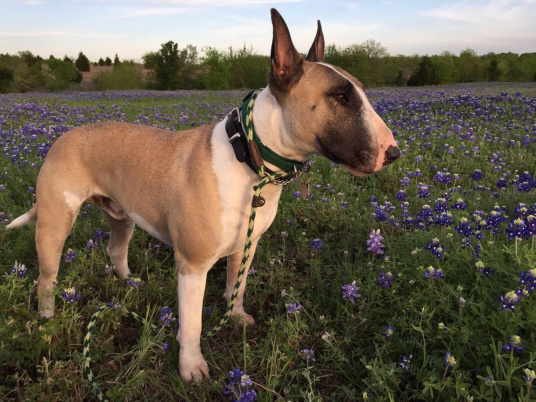 We’ve had five English Bull Terriers, in the last twenty two years, whom we have loved dearly, so believe me when I say – Mr. Kippers IS different. The second English bull terrier was in a situation that would have also ended badly, had it not been for a wonderful woman who was in the right place at the right time and able to get him out. She then called me, but little did I know, as my friend and I headed to Houston to pick him up, that a truly unimaginable story had just begun. 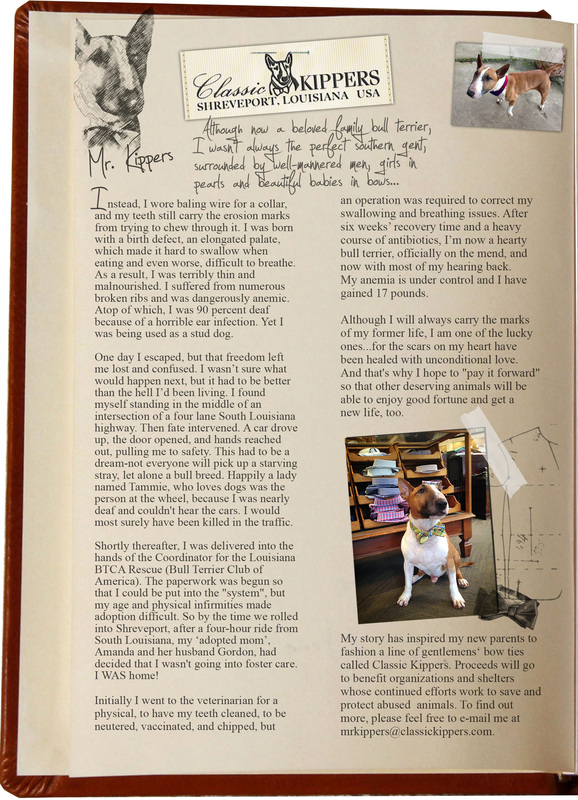 Below is the link to the chapter in Mr. Kipper’s book, where the story of Bruno is told. It was apparent, just from the short time Bruno was at our home, that he WAS one of those special dogs. The story itself received kudos from not only other rescuers, but from people who enjoy hearing a good story- a good, true animal story. It’s one of those wonderful “feel good” stories about how a group of like minded people can move mountains – and quickly – for the love of a dog. It’s been a year since that remarkable rescue and just this past week, an update came my way. I’d like to share it. If you know the story then you might want to skip the link below, but if you haven’t, please take the time to read it before reading the update. Just thought I’d let you know that the second best bull terrier of all time has totally proven the faith we placed in him. As you so well know-I retire early- and Saturday night, I slunk off to bed about eight. All was well: My husband was in the living room watching TV. I never felt Bruno leave the bed- but I sure felt him land back on me and commence to start digging me out! Leaping off and back on the bed til I awoke enough to realise that I needed to follow him…. To the living room- where my husband was in a heap on the floor! This is a VERY special dog. Thank you. Her husband was fine, though he has Parkinson’s and had evidently lost his balance and fallen. Since arriving in Boston, Bruno has trained to be a service dog for this man. He obviously takes his job seriously. This wonderful sweet boy, who came close to losing his life in Texas, has become a beloved and treasured part of a family in Boston. Rescue saved Bruno’s life and Bruno is saving the man’s by improving his quality of life. When they walk, Bruno is there for stability, when he relaxes Bruno is there to comfort. And now, Bruno has proven that if the man is in need- he will be there to get help. He, too, has “will and purpose”. WOW, WOW and bow-WOW! You REALLY have that most incredible gift of knowing a “good ‘un” when you see ’em! Because of YOU, Bruno landed in that wonderful family, wonderful home, and received the extra plus of sensitivity training as an educated caregiver for his new “daddy”, that led to this beautiful rescue he performed with those character traits that make for champions, heroes – few and far between as such outstanding feats are. These 4-legged friends are lifesavers – more times than we know. Their intuition is amazing – they seem to have a gift of paying attention to things we might overlook. And, THIS instance demands a salute to not only him, but you, Amanda. Congratulations and hats off for a lifesaving job. Wow! WOW…what a wonderful story. Bruno, like Kippers, is a special dog!! !